When I was growing up, breakfast and dinner were my most memorable family times. In the summertime, my mom often prepared scrambled or soft-boiled eggs, toast, and bacon or cold cereal and milk with fruit before my brother and I went to day camp. During the winter months, she often made pancakes, waffles, or Cream of Wheat cereal and doctored it with ingredients that made it taste and smell so good. It really warmed up my brother and me before we ventured out into the cold to catch the school bus. Dinnertime was just as special. When meals were ready, my mom called my brother, dad, and me to the table. We said grace and proceeded to eat. We often talked, laughed, and enjoyed the food, which always was delicious because my mom was such a great cook. She would make chicken potpie, lasagna, turkey tetrazzini, paella, ratatouille, and many other dishes I don’t have room enough to mention here. My mom also made sure our meals consisted of chicken, beef, or fish; vegetables; and a starch. And if we ate all our food, we had dessert. Little did I know that eating such meals with my family was instilling healthful eating habits I’d carry into adulthood. While I’m not as good a cook as my mom, I do prepare dinnertime meals that include vegetables, a protein, and a starch and make sure my family eats together most nights of the week. My brother does the same with his family. The feature article “Family Mealtime,” on page 30, discusses this very topic. It reviews some of the latest research showing that kids who eat regularly with their families are more likely to develop healthful eating habits and less likely to be overweight or obese when they grow up, among other benefits. 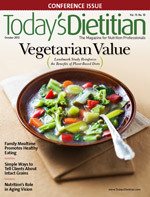 Be sure to check out the article “Vegetarian Value,” which discusses the incredible findings of the Adventist Health Study-2—landmark research from Loma Linda University researchers who examined the lifestyle of the Seventh-day Adventist population in Loma Linda, California, known for its longevity. We bring you the results that were presented at the International Congress on Vegetarian Nutrition in February. And if you’d like to learn more about how certain foods and nutrients may prevent or slow the progression of age-related macular degeneration, read the article here. Afterward, give us your feedback about these articles and the others on Facebook and Twitter. And please enjoy the rest of the issue!